This Vancouver Public Library image from 1943 shows the St Margaret Apartments, one of the last buildings designed by prolific architect W T Whiteway. Built in 1928, it was part of a flurry of investment that dried up a year later as the recession and stock market crash severely impacted the development industry. Today it’s barely visible behind evergreen foliage, but it’s still providing rental accommodation with 19 apartments, and sold last year for $7,275,000 (at a price per unit higher than we bet the whole building cost when it was built). With the help of Patrick Gunn we tracked down the developer of the building, confirmed by the 1928 street directory: John J Perrigo, proprietor, St Margaret Apartments (living in apartment 27) who in 1926 appeared for the first time in the city as the owner of Viola Court, a block away at 1200 Haro, living on Seymour Street. It seems likely that he’s the same J J Perrigo who in 1924 was living in Swift Current, Saskatchewan. John Joseph Perrigo died in 1959 in Vancouver, born in Ontario in 1880, and his wife Paula, who was Austrian and six years younger died in 1957. Their death notices each recorded a quite different set of children, and his wife was shown as Paula Blackburn, rather than Paula Glowozuk, her maiden name. Given this, it’s possible that this was a later marriage for both of them. In 1891 John was living in Eganville in Ontario, and in 1911 in Moose Jaw, Saskatchewan where he was a lodger. The apartment replaced the house we saw in the previous post, home to J F Galbraith and mayor Fred Cope among others. This picture was taken in 1890 and shows a very new home, identified as the home of merchant and mayor Fred Cope. The ‘official’ version of Fred’s history says he was born in Oxford, England in 1860. It also says that when he was elected mayor in 1892, in a closely fought race that saw him win by just 11 votes, he was the youngest mayor elected in the city’s history, at just 32. The 1891 Census record shows a quite different record; Fred Cope was born in Ontario in 1850, so was aged 41 (and 42 when elected mayor). His wife, Annie, (Ann on her wedding certificate) was shown as three years younger, and they married in Vancouver in August 1889, although she had also been brought up in Norfolk County, Ontario, and born in Walsingham. When he ran for mayor, The Daily World had a testimonial confirming that he was born in Ontario where he had previous elected experience as a Councillor, Reeve and County Councillor. However, the house was actually developed and occupied a few years before Fred moved in. Fred first appears in Vancouver in the fall of 1888; he was in partnership with Frank Young, selling dry goods, clothes millinery and carpets, from West Hastings near Richards, in a building we showed a few years ago. In 1889 both partners had a room in the Leland Hotel. In 1890 Fred was living on Hamilton Street, and when the 1892 directory was published this was the home (for the first time addressed as 1100 Haro) – of J F Galbraith – Fred was still on Hamilton Street. Julius Galbraith ran the ‘Japanese Store’ on West Hastings, appeared for the first time in a street directory living at 30 Haro Street in 1889 – which we think might well be this house, as the street was completely re-addressed in 1892. Like Fred, he was from Ontario, as was his wife Sarah. Unlike Fred and Annie he had children – in 1891 there were four daughters who had been born in Manitoba, one in Ontario and a son and infant daughter in British Columbia. We assume that’s the family pictured on the balconies. It looks as if the family later moved south to Oregon; they’re shown living in Grant’s Pass in 1910. Fred Cope was elected mayor of Vancouver in 1892, and again in 1893 (with an improved majority), taking over from David Oppenheimer (with whom he was closely aligned). His timing was unfortunate: the economy was in a steep decline, businesses were headed to bankruptcy and soup kitchens were opening. The mayor and council were forced to restrict investment in new facilities, cut wages and lay off city employees. Fred moved to this house in 1893 or 1894, (the first street directory that shows him here). By the end of the 1890s the house looked very different, with significant street trees (one we think is still growing today). Cope and Young continued in business for a while as house furnishers with premises on Cordova Street. In 1897 there are two people called Fred Cope living in the city – Frederick T Cope, (a contractor who was born in England) lived on Richards Street. He was younger than the former mayor, and he’s probably who the biographies got the mayor mixed up with. 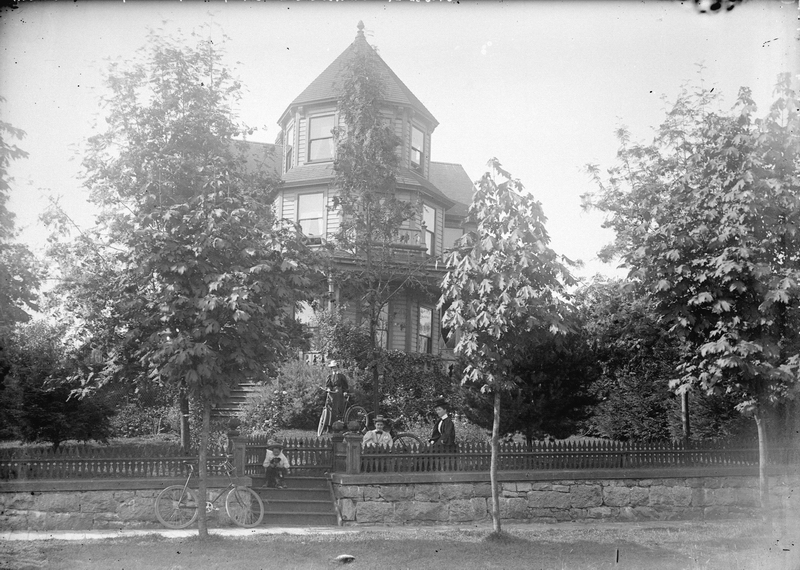 In 1899 Mrs Cope was shown living on Robson Street. In the fall of 1897 Fred had headed for Alaska with a pack train to supply the gold rush that had helped reinvigorate the Vancouver economy. He was crossing a ford between Shallow and Middle lakes when the horse he was leading fell. He tried to help the horse and the current swept him away. His body wasn’t found until June 1898, and his wife discovered that although he had $5,000 of life insurance, the company would not pay up because the Canadian area of the Klondyke next to Alaska was ‘uncivilized territory’. His obituary confirms he was 47 when he died, and that he had first entered business with Frank Young in Simcoe, Ontario. They had sold the furnishing business before Fred had the idea of making money from running a pack train to the Klondike with Ambrose Blayney, with his wife accompanying him as far as Skagway. After his death Annie Cope took on running a lodging house at her Robson home, shown in the 1901 census living with her servant Sui Chong and a number of lodgers including three couples. In 1901 this was the home of Howard Walters of Britannia Mines. The metal-bearing ore at Britannia was discovered in 1888, began production in 1905, and after nearly 70 years of underground operation produced more copper than any other mine in British Columbia. At one time it was the largest copper mine in the British Empire. For most of its life Britannia was owned by the Howe Sound Company of New York, which was formed in 1903 for the purpose of financing the development of the mine. the Britannia Copper Syndicate was headed by Howard Walters of Montana and J A Adams of Vancouver. By 1901 the Syndicate had acquired numerous claims along Britannia and Furry Creeks with 75 acres of waterfront where the town of Britannia Beach was eventually built. From 1904 for over 20 years the house was the home of Thomas F Paterson, who with his brother William (W Innes Paterson) ran the Paterson Timber Company. T F Paterson had started life in Ontario in teaching, and then studied agriculture (obtaining a degree from Toronto University), moved to British Columbia and helped establish the province’s Agricultural Institutes, before joining the editorial board of the Vancouver Sun. He acquired a third share in a Port Moody lumber company in 1898 before forming his own company with his brother in 1902, adding further businesses in the next few years. He continued to have a financial and Board position with the Vancouver Sun’s parent company as well as pulp and paper interests. Up until the 1920s Mr. Paterson and his family (three daughters and a son) lived in the house at 1100 Haro Street, before moving to a new house on West 3rd Avenue just before the replacement apartment block (still there today) was constructed. 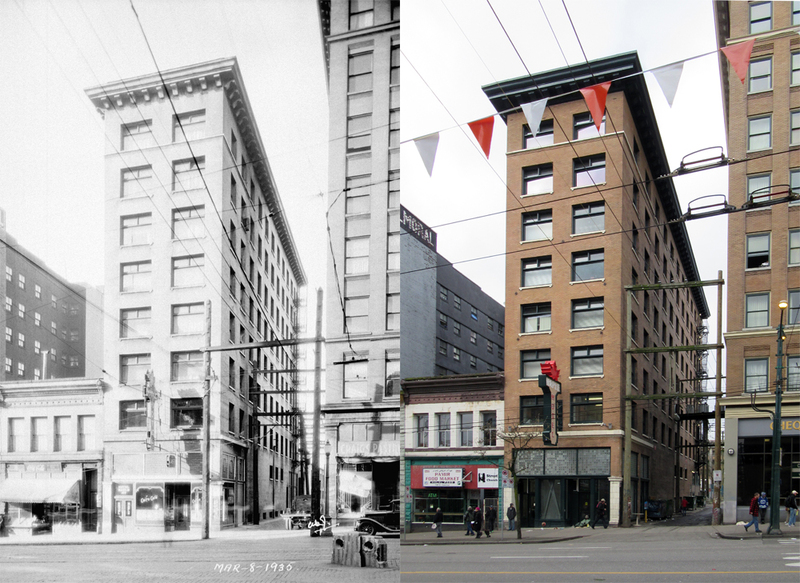 We last saw the Maple in 2012, when it was called the Washington Hotel, and awaiting a significant (and picture-perfect) restoration thanks to the Provincial Government’s program of restoring and seismically updating a series of heritage buildings run as Single-Room-Occupancy residences. The earlier post examined the story of developer James Borland, and some of the hotel’s shadier past. This 1935 image appears to be pretty much the only image of the building’s earlier appearance. The original Maple Hotel name has been restored, along with a reproduction sign on the front of the hotel. There are now 81 units, restored glazing and cornices, and the entire Parr and Fee designed structure’s brickwork has been stabilized, and plumbing and electrical systems replaced. Inside quite a few details of how high-end the hotel was can still be seen; the stairs are marble, with marble wainscoting. This has been restored, the front centre-hung windows have been restored to their original appearance but with double-glazed units in the restored wooden frames, and there’s a gorgeous lighting program on the building at night, as well. Image source: City of Vancouver Archives Hot N65. In 1898 the traffic was pretty quiet on West Cordova – so much so that we suspect it was possible to re-shoot the same picture more than once without worrying too much about anything else getting into the shot. The camera equipment of the day didn’t include point-and-shoot, so these two shots taken almost, but not exactly, in the same part of the street would presumably have required the cyclist to make at least two passes (or they’re identical twins on similar bicycles – the less likely possibility). The remarkable thing is that today – for a short while – it’s possible to line up the mountain profile and the waterline and still reproduce the correct angle, as this midblock part of Cordova consists of a surface parking lot – albeit that the ‘surface’ is actually the top of a parking structure – in 1890 you looked over the roof of a building down at beach level. Today to the west are the sails of the convention centre, or a cruise ship, hiding them, but soon there might be the base of a folded-plane office tower proposed by landowner and developer Cadillac Fairview. 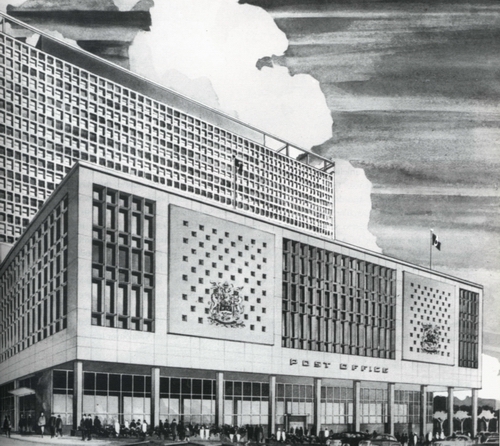 Here’s the city’s fourth post office building, completed in 1956 and designed by McCarter, Nairne and Associates (the same architects who designed the Marine Building). This image was shot somewhere between 1960 and 1980 – although we think it was earlier rather than later in that range, judging from the vehicles – possibly 1965 if we’re reading the plate on the Oregon registered Mercedes correctly. The building is likely to see some fairly dramatic change in the near future. Recently sold by the Post Office for over $150m to the BC Pension Fund, a proposal to redevelop (by adding more structures above the 1950s building) is being considered. That won’t necessarily be dramatically different from the original intent for the building – today there’s a truncated two-storey office on top. but the original design was for a much more substantial office slab tower. When it was built the structure was said to be the largest welded steel frame in North America. That’s an important distinction – there are many bigger buildings, but if it has a steel frame, it’s usually riveted, not welded. The repurposed building could see retail, office, hotel and residential uses, and the current parking area on West Georgia would become a plaza (presumably with the opportunity for some outdoor seating). This 1928 Apartment building was a bit of a mystery. All we were able to find was that the architect might have been ‘Simmonds’ – H H Simmonds who practiced in the city for forty years. Then, thanks to a tip from the Heritage Vancouver Society (who are adding more and more building permits to their database) we were able to confirm the architect was indeed H H Simmonds, and the that developer was C S Gustafson, who spent $80,000 to develop it. Carl Gustafson was a builder (and the builder of this project) who had built houses in the West End as early as 1903, and developed the Clifton Hotel on Granville Street in 1910. In 1911 36-year-old Carl was identified by the census as Swedish (having arrived in 1890), living with his wife Hannah and their three sons and their domestic servant, and a lodger. The building permit was issued in December 1928, and was shown in the street directory as ‘new apartment building’ in 1929, and occupied in 1930 The two fourth floor tenants were Claude Irons, the manager of the Burroughs Adding Machine Co and Laurent Maclean, a clerk with Customs. There’s no earlier building listed at this address on Thurlow – but that’s because it was on the corner with Barclay and the house that was there before was listed as 1100 Barclay. This 1955 Vancouver Public Library image shows the building has remained pretty much unchanged in appearance over six decades. From 1898, for twenty years, the house on this site (designed by William Blackmore) was the home of George I Wilson, President of the Coast Steamship Co, a Scotsman who first arrived in Vancouver in 1887 in the dry goods trade and then made his fortune in the canning business (although in 1900 he was listed as a broker, with an office in the Flack Block). In 1920 Mrs C Parkinson was listed as occupant of the house here, but so too were clerk J J Morley, Robert Norman, an industrial surveyor, F M Robinson, another clerk with the S C Railway and Alex Wood, the local manager with the Rat Portage Lumber Co (whose wife visited Toronto that year). In the Daily World in 1920 Mrs. C Parkinson who lived here was holidaying at Seaton Lake in the Lillooet Valley. The newspaper also reported that Marion G Buller, who lived at the house, registered a new Chevrolet Tourer from here. We assume that this was a very classy multi-occupied rooming house. In 1923 Mrs Nellie Rudd was listed as the occupant and in 1927 and 1928 James Pickford, a salesman lived at the house until it was replaced with the apartment building. Not all the buildings in the West End are in as quite as good shape as they once were. The Broughton Apartments have unfortunately lost their cornice, although the street is in much better condition than in this supposed c1910 picture. The earliest the picture can really date from is 1912, when the building was completed. The building permit for the $100,000 building was approved in December 1910, with Parr and Fee responsible for the design for owner, and builder Peter Tardiff. Although his name appears as contractor on many projects in the city, including a number on Granville Street that we’ve featured elsewhere, this seems to be the most valuable building that he constructed. His other significant investment was the Family Theatre on the 900 block of Granville Street that he built in 1910 as a cost of $25,000, with Parr and Fee also designing that for him. The building started life as the Broughton Apartments, although today it’s known as Gainsborough Place. The site was initially occupied by a house owned by George Stevens. Peter Tardif, as he was recorded by the census, was living at 1121 Bidwell Street in 1911, age 43 with his wife Marie Louise and their eight children (six of them girls) aged between 15 and one, with his 24-year-old cousin, Yvonne Lafrance. His wife was a few years younger, and although both parents had been born in Quebec, all the children had been born in British Columbia. In the 1901 census he was also shown as Tardif, which suggests that the more commonly recorded Tardiff was probably wrong. He was listed as a house builder in 1901, and a contractor in 1911. He appears as the architect of some of the buildings he worked on, but as with many of the city’s contractors these were generally smaller jobs. He worked a lot with Parr and Fee on larger contracting jobs, which may be why he chose them to design his investment. In earlier census records, from 1871 to 1891 he was recorded as Pierre Tardif, one of 19 Pierre Tardif’s in Canada – all of them in Quebec. He was married in 1893, in British Columbia, to his wife Marie-Louise Labrecque. When it was newly built this was clearly a smart building. Unlike many of the West End buildings the tenants all seem to have been couples, (or possibly men living alone). The apartments were big; there were only 37 altogether. Among the residents were the architect of the building, J Edmeston Parr, Samuel H Henderson who was manager of the Vancouver Table Supply Co, Charles Boldrick, who was secretary to William Holden, Robert Creech who worked for Geo A Campbell & Co, a real estate broker, E Crockett and George Kidd who was comptroller of the BCE Railway. Like so many of the city’s rental buildings, turnover was considerable; a year later half of these six tenants had moved on. In 1913 Mr Tardif sold the building to a consortium of businessmen, Morden, Thorton, Kilroy and Morgan for $140,000 – which was a pretty successful return in a very short period – especially in an economic slowdown. Mr. Tardiff continued to build projects through to the 1920s, and we know he was still around because he was at the wedding of his son Raoul to Ivy Flack in 1929, and his daughter Jeanne Louise in the same year. We think Peter died, or possibly retired and moved away in 1933: that’s the last year he appears in the street directory: still listed as a building contractor, living on Blenheim. It appears that neither of his sons worked with their father; there’s no sign of the company name after this, although several of the children were still in the city.